Over four posts, STT covers the causes and consequences of Germany’s renewable energy disaster. This post, the final in the series, focuses on the adverse consequences to health and well-being, and the hatred and the social division that has accompanied Germany’s push for an all wind and sun powered future. Our rural areas have changed considerably in recent years: there is hardly an area that is not already dominated by wind turbines or affected by plans for them. The massive land requirements of this type of power generation are increasingly transforming landscapes and habitats into inhospitable industrial sites. The disastrous effects on fauna, flora and quality of life for those living in these areas aroused a steadily growing social resistance, which is now manifested in over 1000 citizens initiatives. often even bitter enemies. Sometimes wind power even divides families and social clubs. Social togetherness – meaningful for many and a motive for choosing a place to live – is systematically undermined by the incentive system of the EEG. leads to the loss of natural landscape proportions and of size and width, to horizon ”pollution” and deformation of exposed terrain structures. Landscape-related tourism is also being damaged by the expansion of wind energy: although lobby groups regularly deny that wind turbines significantly reduce the attractiveness of landscapes to tourists, this has been clearly demonstrated by recent research and real experience. 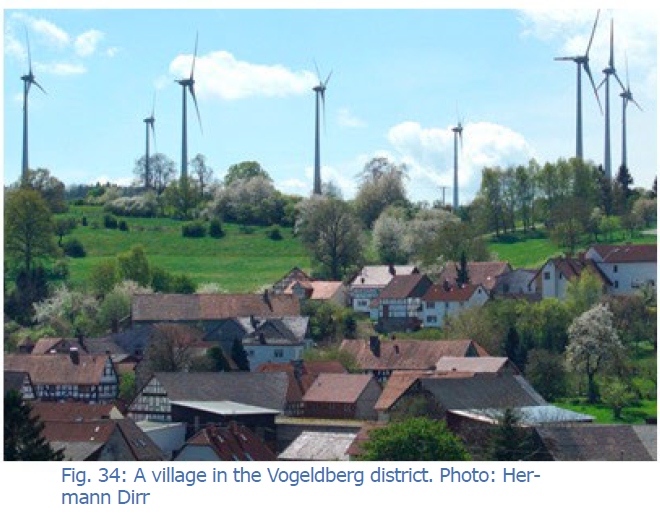 Villages in the Hunsrück region serve as an example: where the number of overnight stays has fallen sharply in parallel with the construction of wind turbines, while the number of guests has increased in neighbouring, less built-up areas along the Rhine and Moselle. In areas afflicted by wind farms, the nights are disturbed by permanent or temporary flashing lights and moving shadows. And all the time, they have to suffer the impact of noise pollution; not only audible noise, but also inaudible infrasound, which is an important effects of Energiewende, robbing people in the vicinity of their quality of life and potentially causing illness as well. Residents living near wind turbines often describe the emission of infrasound in the form of a characteristic pulsing vibration. ’I feel what you can’t hear.” Depending on the duration of exposure and an individual’s constitution, these can cause far-reaching damage. Their quality of life is destroyed through brain-physiological processes: ‘from within’. What noise do wind turbines emit? Wind turbines generate sound when air passes through the rotor blades (in current systems the rotor blade tips reach speeds of up to 400 km/h) and also through the noise of the moving parts of the turbine. This noise can trigger stress effects, such as an increase in the hormone noradrenaline during prolonged exposure, and this can in turn lead to high blood pressure and an increased risk of heart attack or stroke. Chronic exposure to noise always carries the risk of permanent hearing damage. Noise regulations set limits of 35 dBA (at night) and 50 dBA (during the day) for residential areas, and are intended to protect against these effects. The audible noise of wind turbines can be technically reduced, for example by optimal adjustment of the turbine and the rotor blades, or by structural measures. (about 1-2 times per second), compression of the air creates a pressure wave. The operation of a wind turbine therefore generates periodic pulses with a fundamental frequency between 0.5 and 1 Hz. In addition, there are harmonics whose maxima occur in the range up to about 6 Hz. This results in wavelengths of approx. 50 m to 300 m. These emissions belong to the infrasound frequency range below 16 Hz. It is not therefore not consciously perceived by people and is therefore not considered a danger. However, infrasound reaches the brain in various ways and affects the subconscious. Only with extreme sound pressure levels of over 100 dB is infrasound directly perceptible, as vibration on the skin. Greater intensities will soon reach the level of the human pain threshold. Due to the long wavelength, buildings cannot be insulated against infrasound with sound insulation measures; infrasound passes through walls. Infrasound has a much greater range in the air than audible sound. The Federal Institute for Geosciences and Natural Resources, for example, has recorded infrasound emissions from 1.5 MW and 5 MW plants more than 10 km away. Infrasound is transported not only through the air but also through the ground over long distances. In buildings far from the sound source, infrasonic waves can occur as ‘structure-borne noise’, amplifying the airborne infrasound. Underground infrasonic signals are used in seismic measurements for earthquake warning and nuclear explosion detection systems. These are supposed to be built at least 10 km from any wind turbines to ensure that there will be no interference with the instrumentation. Infrasound is a normal part of our environment and is often emitted together with low-frequency audible sound. Natural sources include the sea and or the wind in grass or a forest. Such emissions are harmless because they occur as low-frequency noise. Technical civilisation has also created numerous artificial infrasonic generators, for example road traffic, aircraft engines, industrial machines and many household items. However, such emissions can pose a health risk if exposure to them is prolonged. Infrasound from wind turbines differs from other sources in that it is emitted in the form of rhythmic pulses in the frequency range of approximately 0.5–6 Hz. Pulsed infrasound causes health problems in sensitive people far below the hearing or perception threshold. About 10–30 % of the population is sensitive to infrasound. These people develop a non-specific symptom picture that doctors are only gradually learning to identify. The primary effect, which can already begin after a few days, consists of sleep and concentration disorders, reduced respiratory frequency, anxiety and dizziness, tinnitus and visual disturbances and is accompanied by changes in brain waves. When exposed for weeks or months, a permanent alarm situation develops in the brain; this can be detected as an increase in the stress hormone cortisol. It leads to psychological instability and measurable physical reactions (blood pressure increase, risk of heart attack, and so on). Physiologically, the hair cells of the corti organ of the cochlea are damaged and certain areas of the brain are permanently irritated. Effects on the heart and blood vessels, including pathological changes of the connective tissue in the arteries of the pericardium, have been demonstrated in sound exposed individuals for many years and in animal experiments. The wind energy industry and its pet scientists regularly claim that the discomfort felt by an individual exposed to wind farm noise depends on their attitude towards the turbines. These are ‘imaginary diseases’, they suggest, which do not have a valid medical cause (the so-called nocebo effect). This claim is, however, interest-led and wrong, because the symptoms affect all sensitive people equally (even wind power enthusiasts are not immune to it). Numerous international studies have been carried out in this regard in recent years. For example, the acoustician Steven Cooper, together with a wind farm operator in Australia, investigated the effects of infrasound on an affected population. The residents complaining about health problems but were not with in sight of the wind farm. Cooper had them record the precise times they felt the symptoms, and checked the correlation with the activity of the wind turbines: the symptoms were most severe when the turbines were running very strongly. How does infrasound affect the brain? The path of audible sound into our brain is well known. In the inner ear it reaches the cochlea, where it stimulates the inner ear hair cells. This information is transmitted via the auditory nerves to the hearing centre in the cortex of the brain and is thus perceived by our consciousness. Infrasound, on the other hand, causes vibrations of larger areas of the brain, the inner ear (outer hair cells, cochlea) and the organ of balance, but does not excite the centres relevant for conscious perception. For this frequency range, therefore, there is neither a perception threshold oriented to hearing nor a habituation (desensitization). In April 2017, scientists from the Charité Berlin, the Klinikum Hamburg-Eppendorf and the Physikalisch-Technische Bundesanstalt published new findings on the perception of infrasound in the brain. They used an imaging technique, functional magnetic resonance imaging, and visualized three areas in the brains of 14 subjects that were activated by infrasound (12 Hz, 200 sec. ): These areas – shown in Fig. 36, yellow/orange – are located in the upper right temporal lobe (A), next to the hearing center (B) in the anterior cingulum (ACC), and C) in the amygdala. These areas were activated by infrasonic signals inaudible to the subjects. The upper area in Fig. 36 is close to the hearing centre, which suggests similarities to hearing sound processing. The other two areas are relevant for emotional reactions, such as mechanisms of conflict management and fear and flight reflexes, and autonomous control, such as blood pressure and heart rate. The activation of the three areas disappears when the sound signal exceeds the hearing threshold, i.e. the test person becomes aware of it. Apparently, infrasound works beyond the threshold of hearing and through a mechanism independent of consciousness. 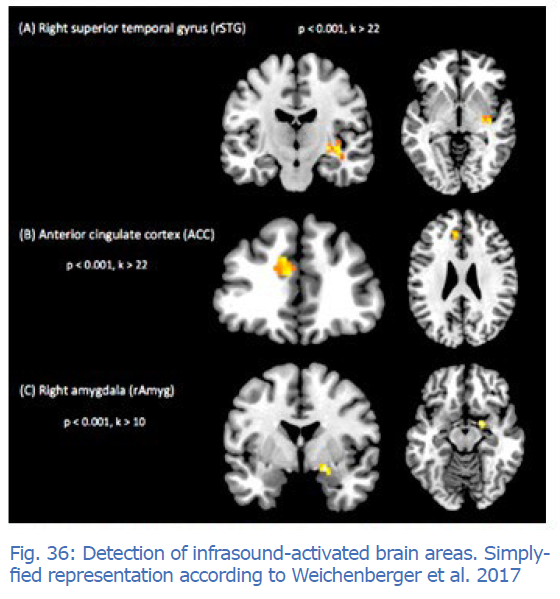 The functions of the brain regions activated by infrasound are in harmony with the medically verifiable stress situation of infrasound victims and explain, among other things, the known findings. This confirmed findings from the treatment of infrasound patients and experiments with experimental animals. All previously valid German protection standards such as the Technical Instructions on Noise and DIN 45680 assume that only noise that is perceived by the sense of hearing can cause damage. Other forms of sound perception are not considered. The measurement regulations are also not helpful, since only sound above 8 Hz is measured, although modern measuring instruments can also detect frequencies of < 1 Hz and the infrasonic range of 1–8 Hz causes particularly severe health problems. The application of these regulations therefore protects against the risks of infrasound just as well as the application of sunscreen against X-rays; that is, not at all. 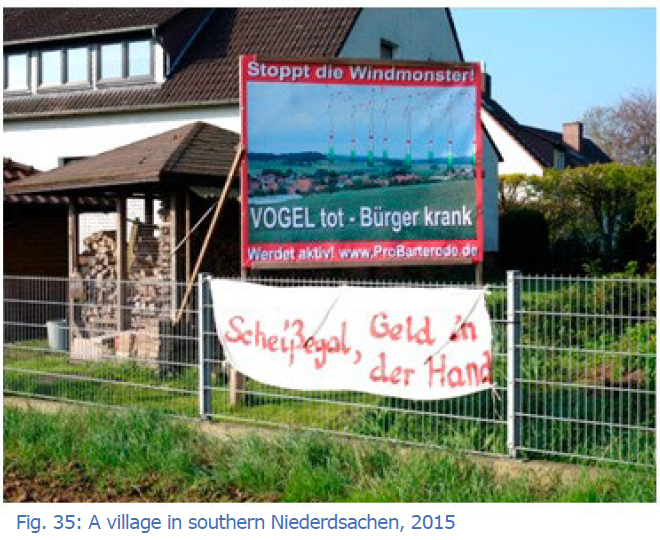 The easing of health problems with increasing distance of wind turbines is well documented. The regulation in Bavaria – distance = 10 x the height – where it is actually observed, represents a first attempt to do what is necessary in terms of health prevention. The health risks of infrasound are played down by most federal state governments as well as the wind power industry. For example, TA Lärm continues to be applied even though its inadequacy is known and a large number of amendments to the law have been submitted. An example of official failure is the publication of the State Agency for the Environment, Measurements and Nature Conservation of Baden-Württemberg (LUBW) of February 2016. It concludes – like similar so-called ‘fact papers’–- that at a distance of 300 m, the infrasound from a wind turbine is significantly below the perception threshold and therefore no health effects are to be expected. Apart from the fact that the ‘perception threshold’ is not a relevant criterion – an impact threshold would have to be determined instead – these statements have already been scientifically refuted. Despite these errors, the LUBW study serves courts, politicians and the wind industry nationwide as the official ‘facts’. With the exception of Bavaria, authorities and politicians have so far insisted on completely inadequate minimum distances (700–1000 m; sometimes even less). And as justification, it is stated that with the medically justified minimum distance of ten times the plant height the ambitious expansion targets are not achievable! This is cynical in view of the recently confirmed health risk that has been suspected for years. All experts believe that further research on the effects of infrasound is needed. The Federal Environment Agency noted this as long ago as 2014, and again in March 2017. The German Medical Association also pointed out the research deficit in 2015. In the same year, the Federal Physical-Technical Institute came to the conclusion that knowledge about the human hearing spectrum and thus about the medical effects of WTGs had to be improved. ’Basically, we’re just at the beginning. Further research is urgently needed,’ the project leader was quoted. 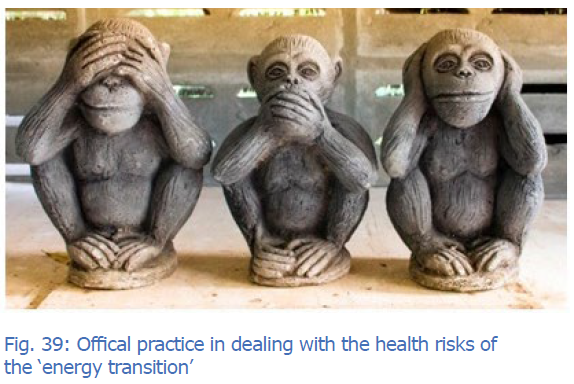 Knowledge of the health risks among politicians and responsible authorities is growing much more slowly than installed wind power capacities. From a medical point of view, infrasound threatens to become the boomerang of the energy transition. A small leap of thought leads from this throwing device to further ill-considered health risks of Energiewende technologies. 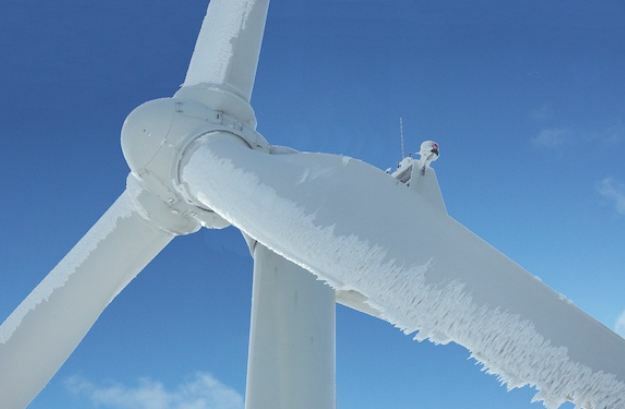 In certain weather conditions, the rotors of wind turbines can throw ice blocks weighing several kilograms, sometimes hundreds of meters away. Attempts have been made to prevent this happening. However, the sheer number of sources of danger – the current plans imply tens of thousands of wind turbines – suggests that serious harm cannot be permanently avoided. Catastrophic material failure is not alien to wind turbines either, as the various reports of broken masts and blades in early 2017 documented. It cannot be expected that on all of the tens of thousands of three-rotor wind turbines all of the blade heating wires will always work and prevent ice formation. Legislators would be expected to regulate risks that have been recognised in other industries where these also apply to wind turbines: asbestos has been banned since its carcinogenic potential became known. The carbon fiber-reinforced plastics (CFRP) used in wind turbine blades carry a potential risk comparable to that of asbestos: if wind turbines catch fire, they are virtually impossible to extinguish; you have to let them ‘burn down in a controlled manner’. Fly ash consists of tiny particles that can penetrate the lungs and cause cancer. With current energy policy, there will be large concentrations of wind turbines almost everywhere in the vicinity of human settlements, always tall and built at exposed locations. It is obvious that lightning strikes and therefore fires will become more frequent. But there are no plans to deal with the consequences. All these topics reveal a pattern: risks are already ignored or downplayed if addressing them might threaten political plans. 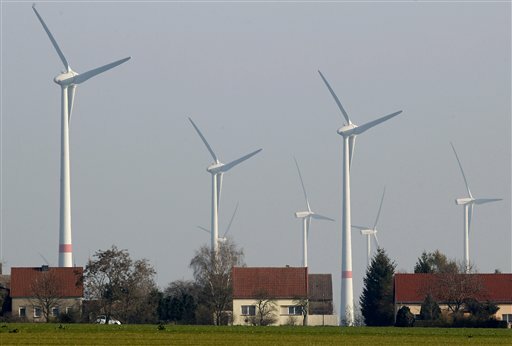 The aim of the Energiewende was to redirect Germany’s energy supply to ‘renewable’ sources. Wind power and photovoltaics were described as ‘pillars of the energy transition’, and were intensively promoted and protected. However, anyone who measures the results of this policy against the energy industry objectives of affordability, security of supply and environmental compatibility will see significant deterioration in all three areas. As explained in the preceding chapters, this is not surprising and also not temporary, because these miscalculations are based on a non-observance of physical laws and technical principles. So long as the policy is maintained, the undesirable developments will continue to intensify and the desired blessings of the ‘energy turnaround’ will fail to materialise. The idea of meeting our country’s energy needs with wind power and solar energy has proven to be an illusion. At present, around 29,000 wind turbines and 1.6 million photovoltaic systems together account for just 3.1 % of our energy requirements. Although their share of electricity is higher, their direct and systemic costs are gigantic. The cardinal problems – weather-dependence and low energy density – are unsolved or unsolvable. The idea often put forward by the government that expanding the areas covered in renewable systems will reduce natural volatility contradicts mathematical laws and has also been clearly refuted empirically. To compensate for the lack of reliability of wind and sun and to be able to actually replace conventional power generation, gigantic amounts of electricity storage would be required. The replacement of controllable power generation with a fluctuating power supply is impossible without storage and unaffordable with it. The present energy policy does not serve the alleged climate protection. CO2 emissions are rising instead of falling. The ‘dirty secret’ of producing ‘green electricity’ is not a transitional phenomenon, but a systemic one. Through emissions trading, a (global) tax and open-technology research funding, the target of CO2 reduction could be achieved much more cost-effectively. Instead of’ climate protection’, the incentive system of the EEG induces environmental crime, sows discord and causes unprecedented landscape damage and destruction of nature. Independent scientific panels have long been calling for a change of course. Unfortunately, legislators do not appear to have been listening. A sensible executive is required to recognise the primacy of physics and to reorient energy policy towards the well-being of man, nature and Germany as a business location. Before a corresponding market design is found and established, a moratorium on the promotion of renewable energies makes sense, as the expansion of capacities has already exhausted the system’s ability to integrate. Those who want to successfully implement the energy transition must overcome the political resistance of the biggest profiteers of the current subsidy system for the benefit of consumers. Die National support for renewable energy should completely cease in the future or at least be technology-neutral if the political power in this policy area dominated by interest groups is insufficient. 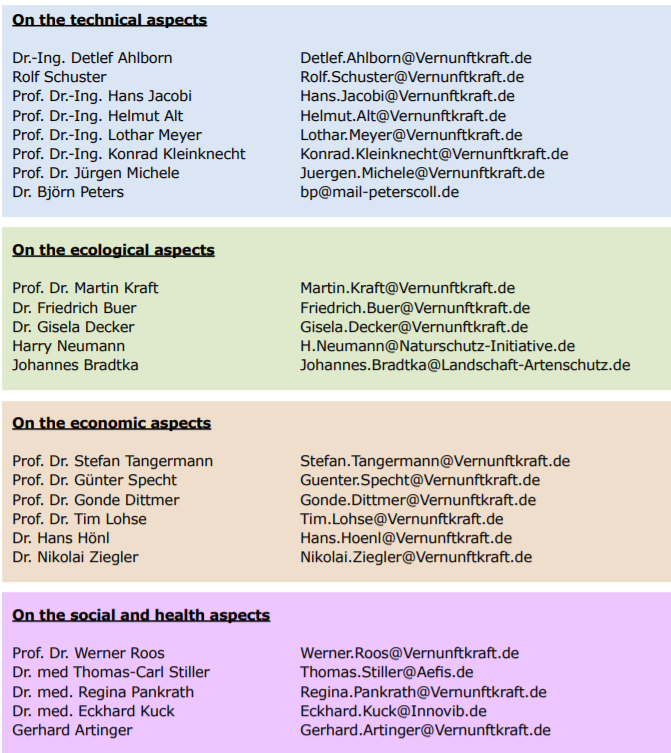 German Council of Economic Experts, 2015. The recommendations of the ‘economic wise men’ should be implemented immediately: the integration capability of the system was exhausted in 2013, and it was overstretched by the end of 2017. A moratorium is imperative. The last EEG ‘reforms’ brought only the appearance of progress. Under pressure from those benefiting from the subsidy system, the fundamental design errors were retained and also transferred to the tendering procedures. The EEG should not be reformed, but abolished and not replaced. Renewable energy companies must hold their own against the competition and be subject to the same regulations that apply to other economic actors. In particular, their legal privileges in planning and conservation law must be abolished. These measures serve to leave the wrong track and enable the search for orientation. After a pause for reflection, a new attempt is needed. All scientific findings must be taken into consideration and the physical and economic framework must be better taken into account than previously. If we want to abandon the use of coal, oil and gas by the end of the century, we must develop alternatives today. So far, they do not exist, because the sun and wind are too unreliable to supply modern economies with energy. The techniques for efficiently storing solar and wind energy or converting it into chemical energy have largely not even been researched. What we therefore need is a large-scale and generous energy research programme that covers all aspects of energy efficiency, storage, transport and generation in a technology-neutral manner. It was a mistake to cut government research budgets in the 1990s. Many talented researchers have left Germany or changed professions. Reconstructing energy science research is a task that must begin with universities. The best scientists and engineers must once again be inspired by the energy sector. It will also be necessary to use the knowledge of older researchers. It is imperative that we take these steps. However, it requires a lot of determination. Whoever strives for reasonable changes will find support and encouragement in our network of more than 800 citizens’ initiatives throughout Germany. The road to a sensible energy policy is a long one. May this compendium accompany him. In addition, the contact persons listed below are happy to provide more detailed background information on their topics. Decision-makers, journalists and disseminators are invited to provide themselves with argumentative provisions. With this in mind, we wish everyone and us a good journey. All this revealing information and still Australia keeps constructing wind farms. Typical. Thanks STT for posting these amazing articles. I am reading the above information with considerable interest. Some have stated to me that a distance of approx 40-50 kilometres is required to break free from the worst impacts of infrasound from these massive industrial facilities. However many of the noise footprints from the wind farms in Victoria and South Australia will cross over like the ripples in a pond when two pebbles are thrown at the same time, creating a cumulative impact with no place to hide. And for those who think that Portland is not impacted, this is not the case in my experience. The peninsula is effectively entombed in infrasound from wind turbines. Whilst people have stated to me that they support our stance and agree there are health issues, they also feel that the issue is ‘too big’ to take on. Some further links below that may be of interest from the superb BBC TV series Windfarm Wars. Thanks to Mike Hulme and the Den Brook Judicial Review Group for all of your efforts. The Waubra Foundation have posted a link below in relation to the DBJRG. An example of permanent wind farm noise monitoring is contained within the above article. The Cotton Farm wind farm link is also below. Quite so. That Germany has latterly acted in the manner indicated by these articles published over four days and with the results indicated is, quite frankly, cause for modest satisfaction. Reunification in 1989 was a deplorable development. If Germany now finally disappears under the weight of green obsessions and immigration woes I, for one, will experience neither sorrow nor regret. That Australia has not the wit to avoid the same fate is a genuine cause for regret, if only because a hot meal in the evening is important in this household. But there you are. As George Orwell observed: “One has to belong to the intelligentsia to believe things like that: no ordinary man could be such a fool” (“Notes on Nationalism” ). What’s genuinely worrying is the “ordinary man” has decided to accept the intellectuals’ propositions on energy generation—to the effect that even sandwiches in the evening will seem luxurious.